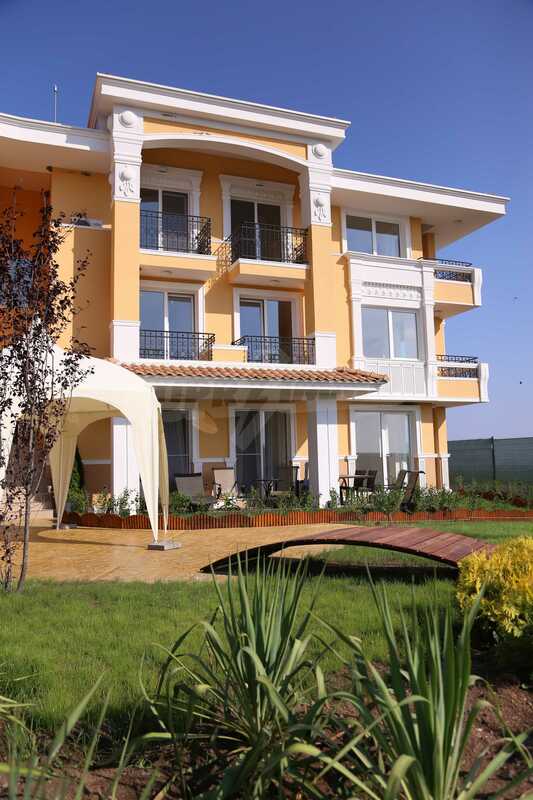 Apartment for sale in Kosharitsa, Bulgaria. Family apartments in natural surroundings. Sunset Deluxe Marittima. Atmosphere inspired by the spirit of the Tuscan Riviera in Italy... 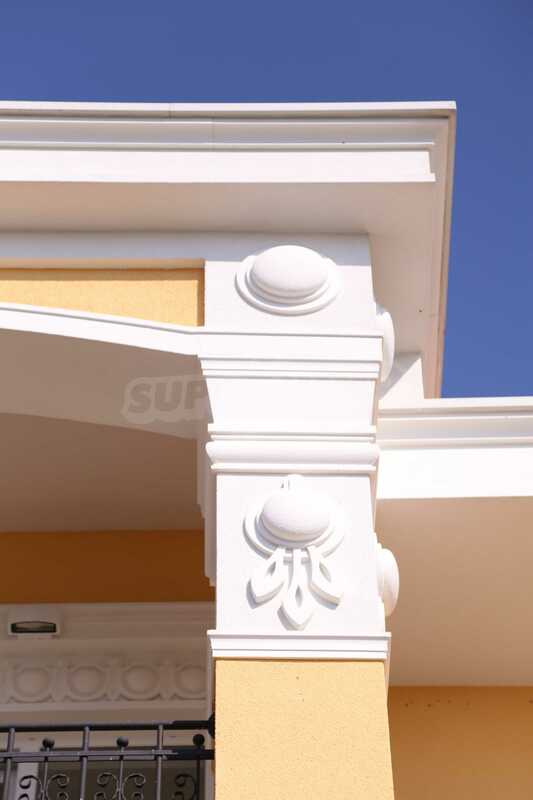 Style following the classic Italian architecture... Close to the nature and in harmony with it! 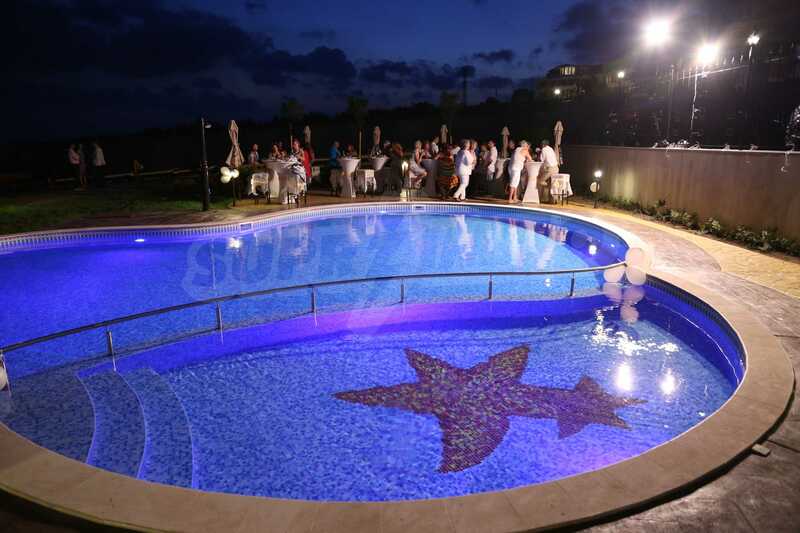 Unlike most holiday complexes built along the Bulgarian Black Sea coast until now, Sunset Deluxe offers a quite different concept of location, life, recreation, design and architecture, decoration of interior spaces, service and maintenance. Dedicated entirely to the idea of La Dolce Vita, recreating it into watercolour landscapes of the region, Sunset Deluxe aims at people who appreciate high their quality of life, seeking a peaceful environment and striving for satisfaction of all their senses. 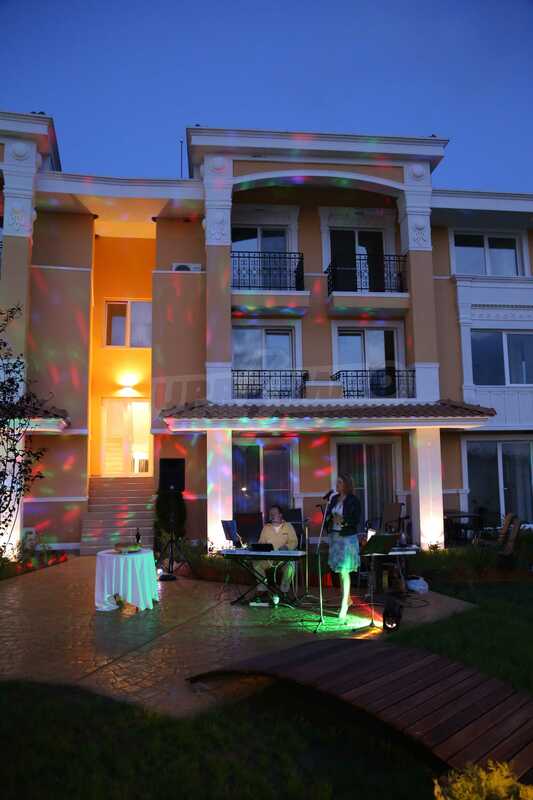 Sunset Deluxe is the newest and elite phase of the gated mini resort Sunset Kosharitsa located close to well-known seaside resorts - Sunny Beach, Nessebar and Sveti Vlas. 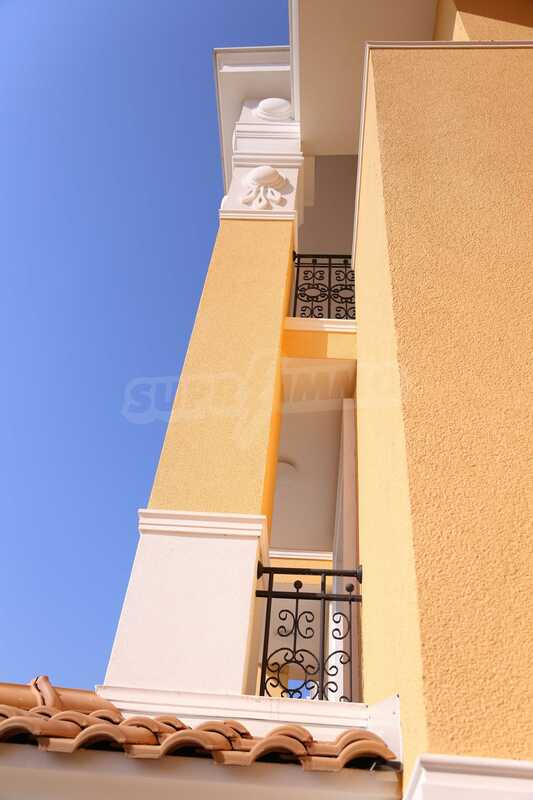 Sunset Deluxe is a completely different concept of "premium class" gated complex of holiday apartments. From the standpoint of our experience and having seen a lot of conceptual mistakes being made, which have led to negative effects among various holiday complexes in Sunny Beach area, the developers from Chobanov & Stoyanov Ltd have approached the market in a radically different way. 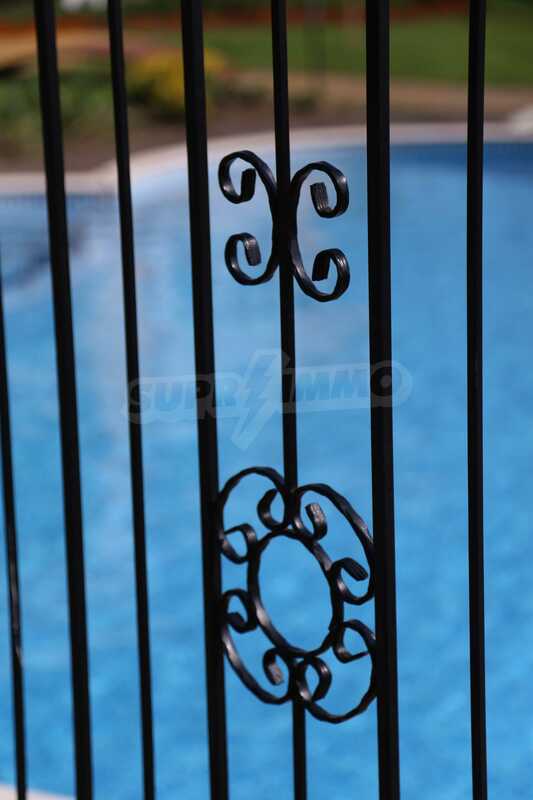 They have designed an elite gated complex of club type inspired by the atmosphere of the Tuscany region in Italy and the style of the classic Italian architecture. • Great classic design of buildings in the Italian style and interior design of the spaces - a work of the best Bulgarian architects of recent years Genig Studio. • Superb landscaped flower garden whose landscape design is inspired by the typical Italian gardens. 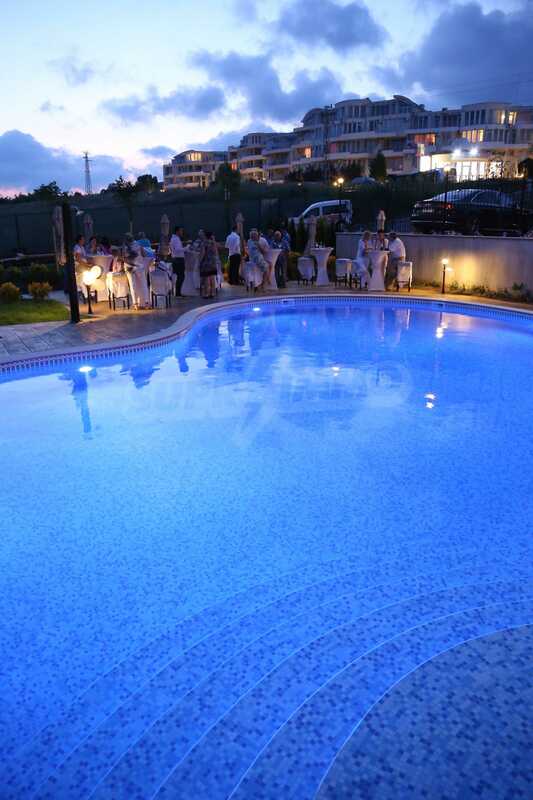 • Emphasis on the perfect service to the residents and their satisfaction – year-around operational mini-resort, service at the highest level by professional staff, tasty Bulgarian food and drinks, excellent opportunities for leisure, regular transport links to neighbouring resorts, the town of Burgas and the airport . And all that at very reasonable prices that will surprise you pleasantly! Sunset Deluxe consists of 6 classic Mediterranean style three-storey villas; each of them has an unfolded built-up area of just 1,187 sq.m. 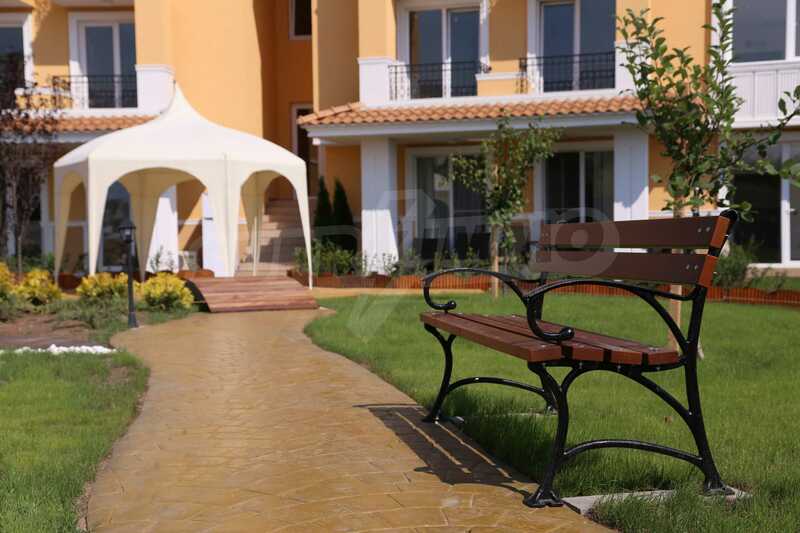 Each of these beautiful villas is surrounded by picturesque landscaped areas - gardens with a lot of greenery and various decorative plants, 6 pools for children and adults, zones for leisure and walk and various facilities for recreation and sport. 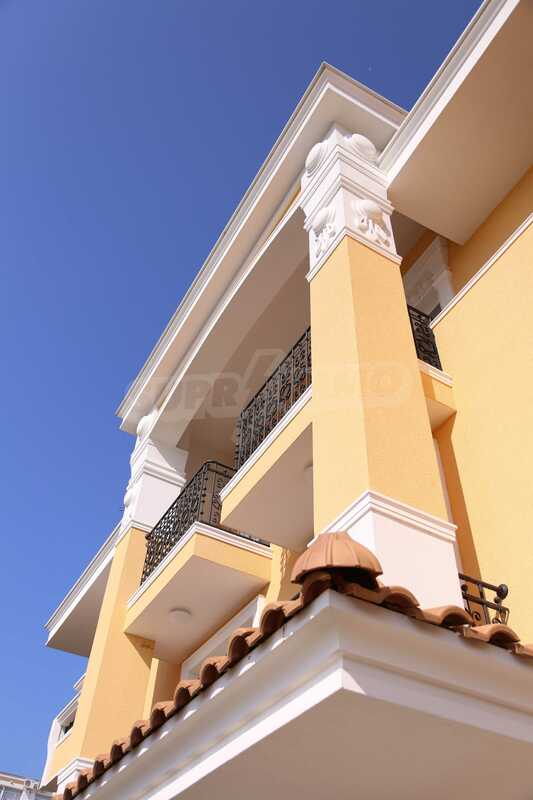 • Perfect design and architecture in the classic Italian style, unmatched on the Black Sea coast! 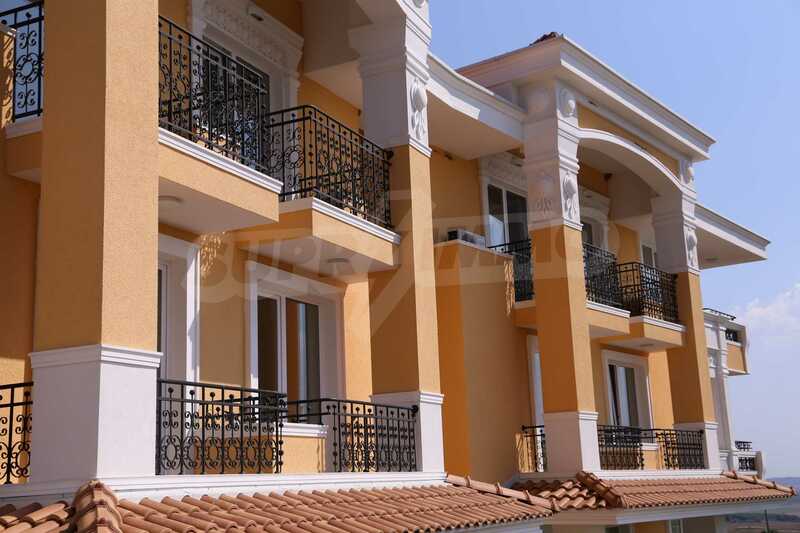 • Low-rise 3-storey development consisting of villas with apartments, each of them has an unfolded built-up area of 1,187 sq.m. • Flexible concept of apartments with an option to purchase from smallest studios to one-bedroom and two-bedroom apartments. There is an opportunity to buy apartments with own garden terrace. Unique apartments with own garden terrace on the ground floor of the building. 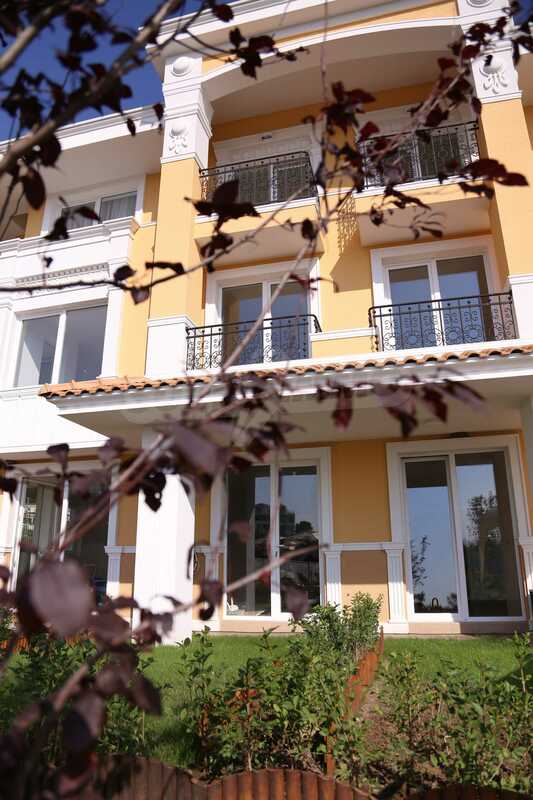 Apartment with high ceilings of 3.00 m on the top floor. 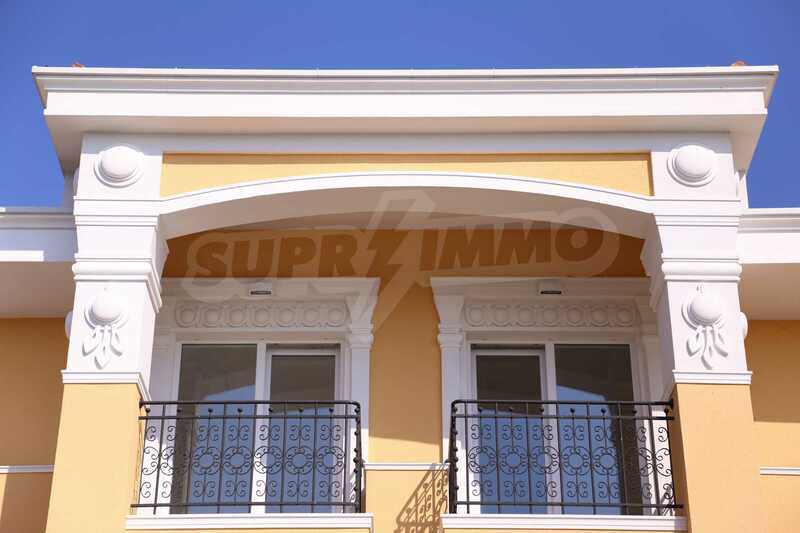 • Fair prices for such high quality of construction and standard of finishing works (the prices start from 610 to 640 Euro/sq.m. including VAT. • Wonderful set of features corresponding to the classical vision of luxury life and vacation for the whole family! 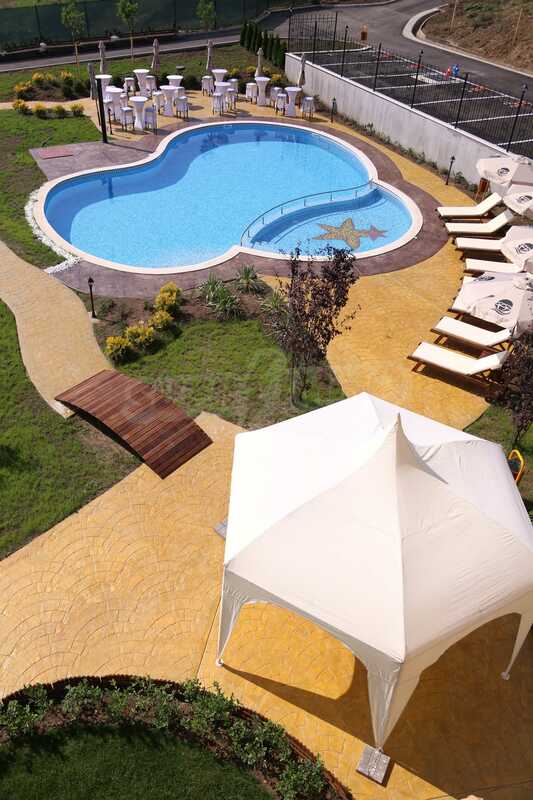 The complex is completely separated with its own fence and access control (barrier with controlled access), but naturally incorporated as an integral part of the famous mini resort Sunset Kosharitsa, located in close vicinity. 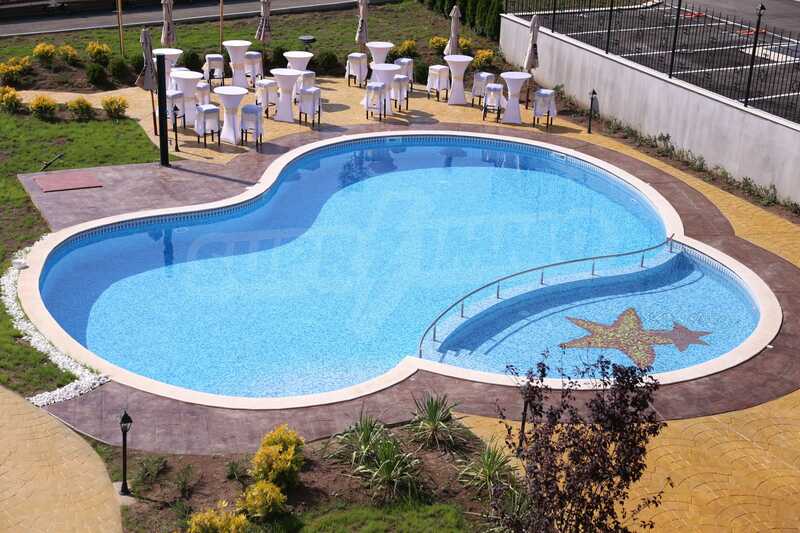 Built in several stages during the period 2004-2011, today mini resort Sunset Kosharitsa is one-of-a-kind in the area of Sunny Beach located close to the mountains, forest and the sea. 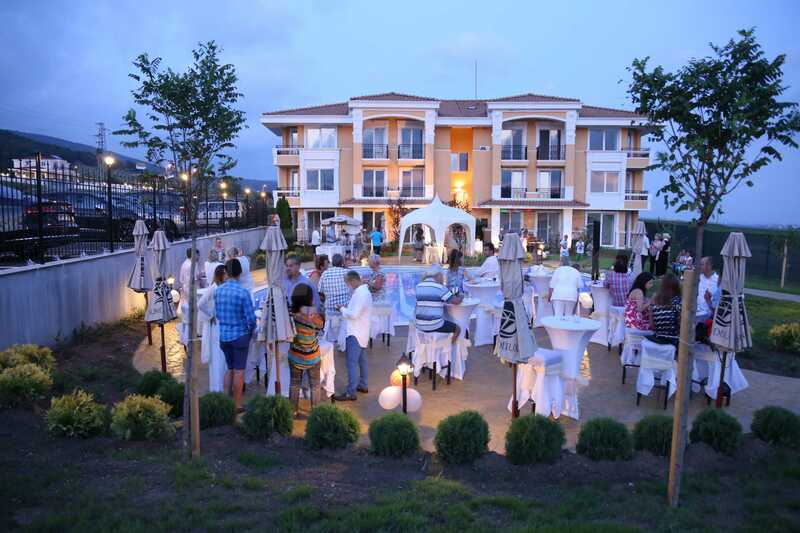 The mini resort is located at the outskirts of the well-arranged seaside village of Kosharitsa, in close vicinity to the last hills of Stara Planina Mountain, in an area with deciduous trees and panoramic views to the whole bay of Sunny Beach and Nesebar. These well-known seaside resorts are located about 7 km away from the complex. The access to them is quick and easy via well-maintained asphalt roads, by own car or public transport as well as by our own regular transport - minibuses, organized by the complex. 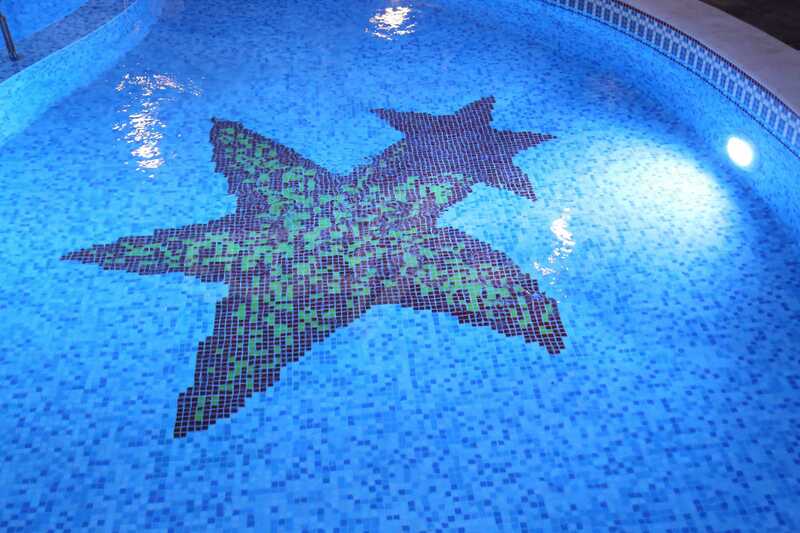 • Sports centre with gym and wellness area - sauna, steam bath, massage rooms, etc. • Tennis court with artificial turf which can be used as a football field with small doors. • Travel services - organization of trips, tours, extreme sports etc. • Recreation and medical centre, which will be completed in 2014 with a lot of opportunities for healing and beauty treatments. Mini resort Sunset Kosharitsa is appropriate for permanent living and offers to the owners year-around a lot of useful services - cleaning, laundry, maintenance of the properties, repairs, babysitting, shopping on order and renovation of the properties, airport transfers or transfers to any other places in the country or neighbouring countries and many other services for the owners. For guests with special requirements our team offers VIP-service at the highest level. 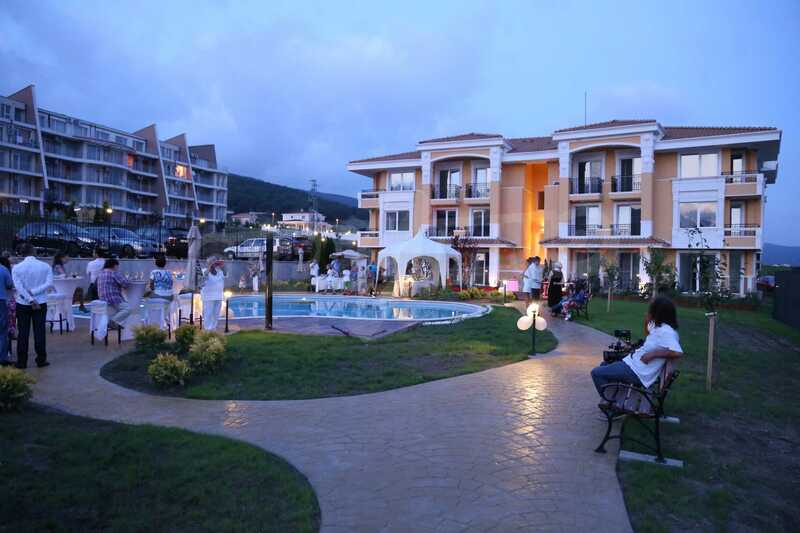 All owners, guests and tourists staying at Sunset Deluxe can use all the facilities unlimitedly in the mini resort Sunset Kosharitsa on special terms as well as use discounts on certain terms at the shopping and entertainment areas of the complex. For more information and full details of the concept and features, please read the information following links below as well as in sub-pages at the top of this page. 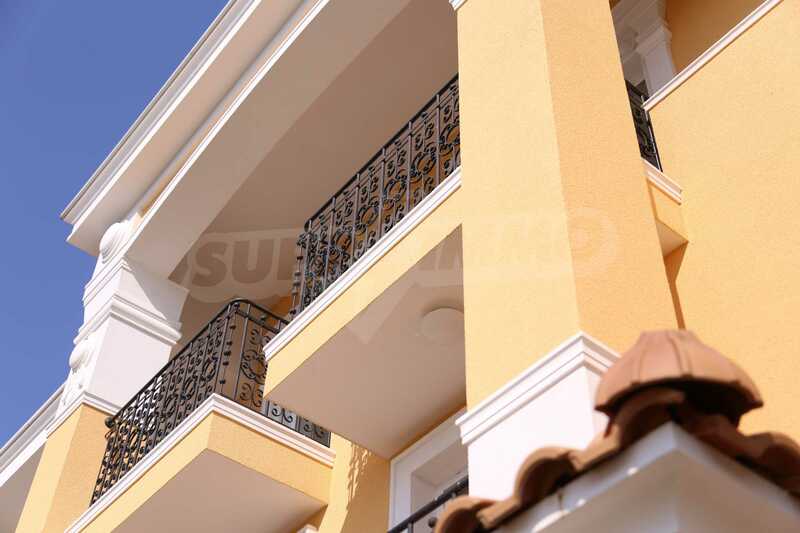 Sunset Deluxe has enough number of open parking lots for cars that are offered for sale at a price of 2,000 Euro/unit. The parking lots are standard with a size of 2.5m х 5m and a total area of 12.5 sq.m. In order to prevent illegal parking, each parking lot is provided with a adequate safety lock mechanism with an access key. "One of a kind" — this is the main advantage of Sunset Deluxe! 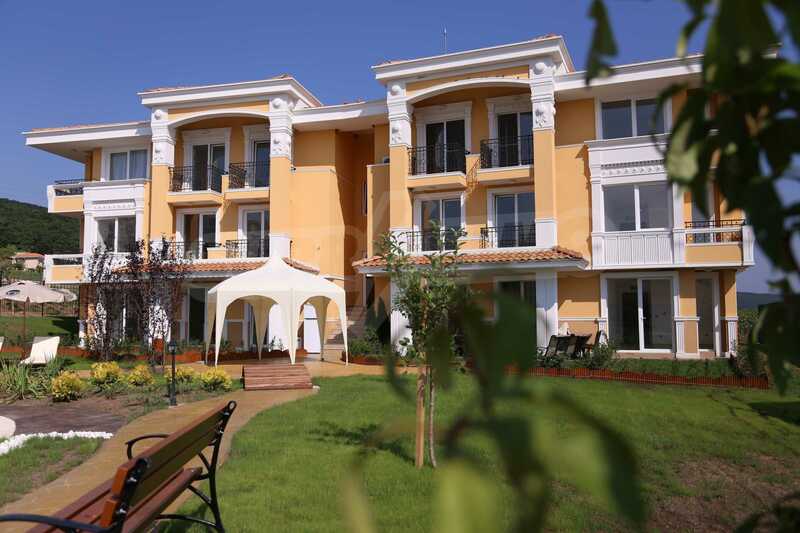 You will not find such a residential complex anywhere in Bulgaria and even in whole Eastern Europe! The joy of having something unique will always be with you in Sunset Deluxe. • Minimum density of the construction on the territory of the complex that gives the advantage of open spaces, recreational areas and green zones in front of the buildings. • Low-level, three-storey construction of small-scale buildings — each with just one entrance and a built-up area of only 1187 sq.m. • "Apartment villa" and not a block of flats — a unique concept in the construction of buildings that resemble beautiful free-standing villas, surrounded by greenery, air and a lot of space around them. 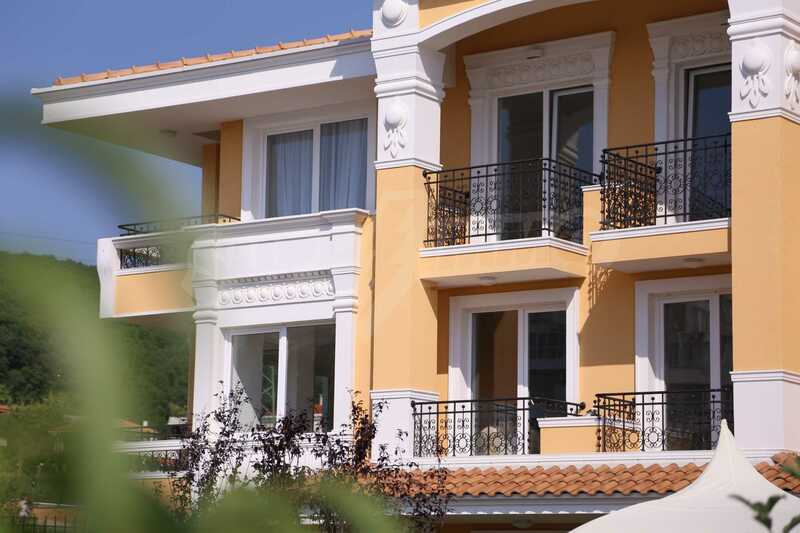 • The villas bear the elegant and distinctive architectural design, typical for the style of the buildings along the Italian Riviera. 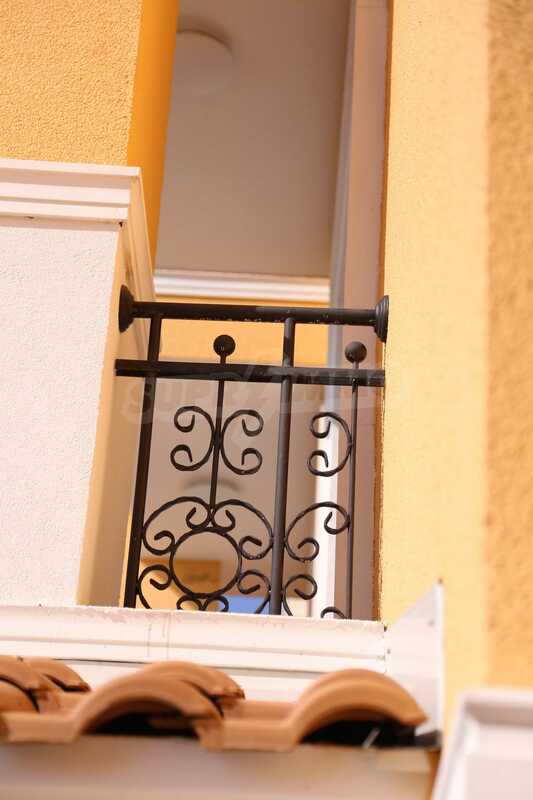 • Residential building and not an apart-hotel — in order to secure the peacefulness and safety of the owners, the short-term rental to tourists is not allowed. • Concept "Yard without automobiles". • Open–space layout of the apartments — opportunity for the owners to transform the apartment’s layout according to their own desire. • Individual architectural design — an opportunity to design the apartment entirely and accordingly to the client’s understanding. • Deferred payment by installments for a period of up to 10 years with a minimum interest rate per year. 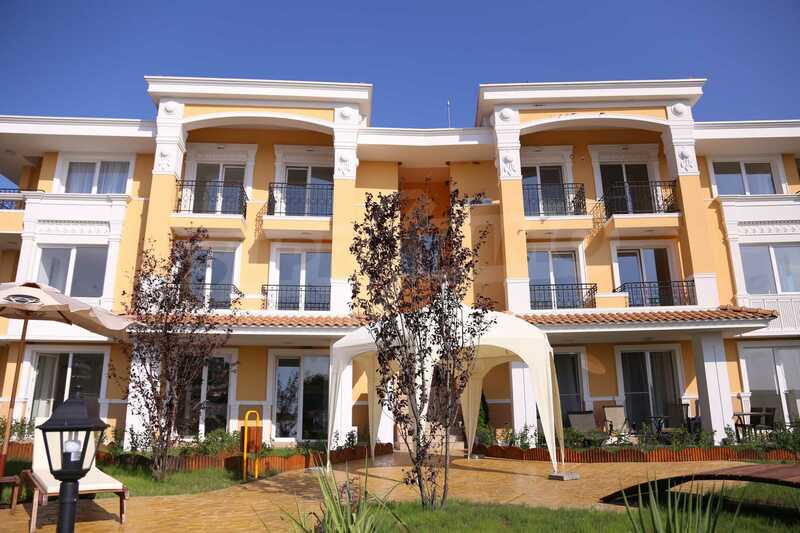 • Full payment (100%) of the apartment’s price on installments, by wire–transfers to the account of the development company in a Bulgarian bank. • Notary transfer on the actual price paid and inscribing the full price in the Title deeds. 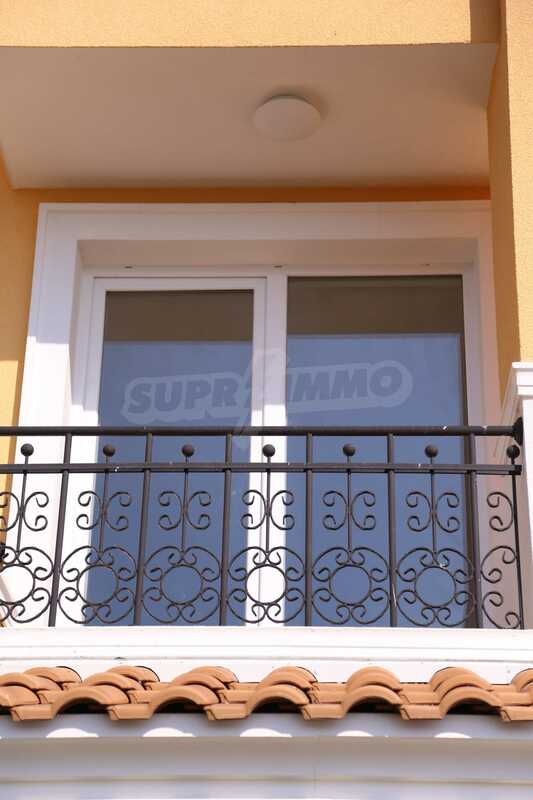 • Unbeatable prices for such high quality of the construction, design and environment: from 650 to 695 Eur/sq.m for the apartments and guarded parking lots for just 2000 Euros. 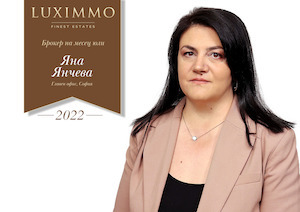 The management of the complex is done for an annual tax of only 9 Euro/sq.m. Reasonable prices and many additional discounts are available at the restaurants and shops in the complex. • This is an investment in the quality of your own lifestyle! 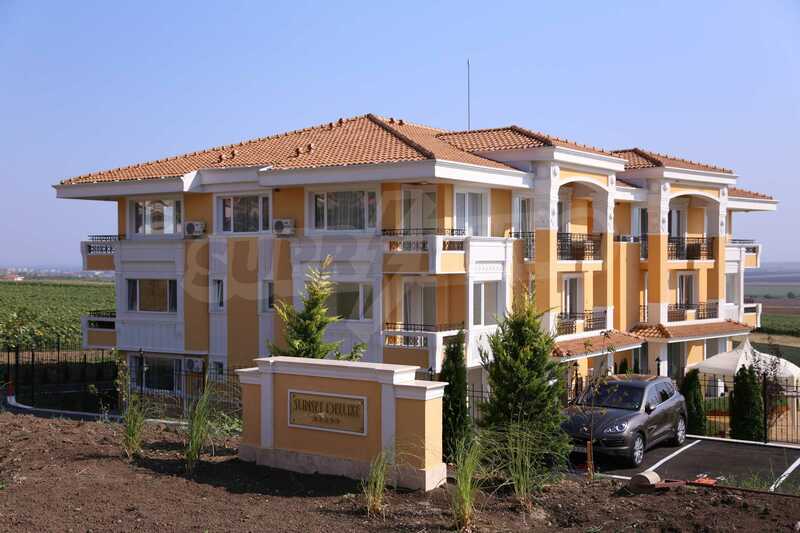 292 €/sq.m. Area: 32.98 sq.m.